By Peter Anderson 194 Comments - The content of this website often contains affiliate links and I may be compensated if you buy through those links (at no cost to you!). Learn more about how we make money. Last edited January 5, 2019 . 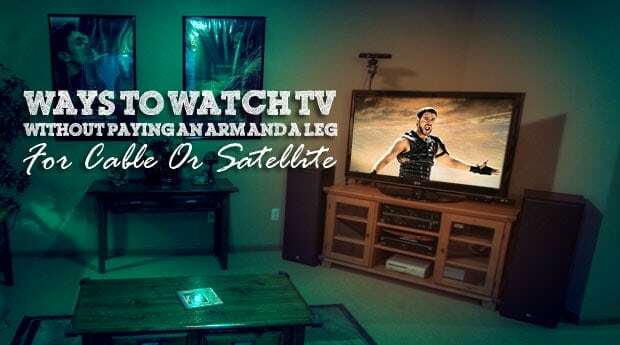 One way that my wife and I have saved money over the years is that while most of our friends have cable or satellite TV, we've never paid subscription costs to receive TV programming. That means that we are saving ourselves a good chunk of money every year. If you're in debt, you probably shouldn't be paying for TV either! Rates for cable in our area range anywhere from around $12/month for the basic package with only local channels to well over $100/month for upgraded offerings with premium channels and shows. We probably would have ended up going for a middle of the road package, somewhere between $50-60/month. How much have we saved every year by not paying subscription costs for our TV entertainment? Probably between $600-720! That's a lot of money! The good news is, TV doesn't have to be that expensive! In fact, TV can be cheap or free! The total cost was $168 for the first year, and $108 for every year after. That is a lot cheaper than if we were paying for cable! Here's a video showing how easy it is to install PlayOn. For a more detailed look at installing Playon, check out this post on Installing Playon. The PlayOn software is installed on our home computer connected to the network. 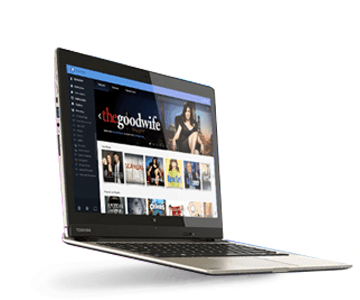 Once installed PlayOn has a media server running in the background that pulls in shows from major video content providers, and allows the PC to pull in the video streams in the same way that a web browser does. From there you can set it to record shows, record entire series, or record new episodes. Or just watch a stream live. PlayOn is a streaming hub which organizes all of your favorite online streaming sites and all of your personal media into one convenient location on your PC…It offers content discovery & management and functions as a media server and online DVR all wrapped into one easy-to-use interface. Check for your local digital stations here. Which antenna do we use? 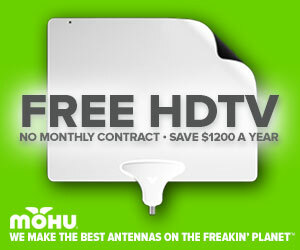 We have the Mohu Leaf 50 digital HDTV antenna (review at the link). We love it and we are able to pull in 35 strong channels over the air, and another 14 with a low signal! I'd also recommend the SMARTenna from Channel Master. Honestly we could probably survive on our over the air channels alone, although my wife likes to have our cable TV fix every once in a while – which is why we have PlayOn. If you're using an antenna like the Mohu Leaf, you can also buy an over-the-air DVR, similar to what you would use from your cable company, but with more features in some cases. Tablo DVR: The Tablo DVR allows you to watch live TV, record shows or record series, much like a cable company DVR. It also allows you to watch recorded shows or live TV on all your devices like set top boxes, phones, tablets, etc. A comprehensive Tablo review can be found here. Channel Master DVR+: Channel Master DVR+ will allow you to record shows or watch live TV, in addition to viewing streaming video from a variety of sources. Rumored to be adding more streaming TV channels and possibly Sling TV into their guide soon. Channel Master DVR+ review here. HDHomeRun Extend Tuner & DVR: The HDHomeRun Extend is a network over-the-air tuner that will sync up with their HDHomeRun DVR software, or with a third party software like Plex to watch Live TV and record your favorite shows. I use it in conjunction with Plex Media Server and it works great! Read a full HDHomeRun Extend review here. In addition to the options above, you can also watch TV for free through a variety of websites online. While it isn't as fun to watch the shows on a small computer monitor, it is still a good option I think. Many of these online options may be available for streaming through the PlayOn software in the future as well. UPDATE: You can now watch video from any streaming website on your TV using your Google Chromecast. Check out details of how to stream video from your computer to your TV here. Hulu.com: probably the best one out there in my opinion, already works through PlayOn, but you can watch it on your computer as well if you'd like. 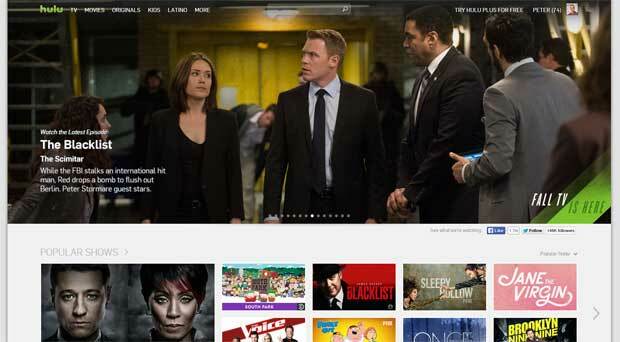 TV Network Websites: ABC, NBC, CBS all have good full episode streaming options available. Crackle.com: Watch tons of movies and TV shows. Pluto.TV: Tons of free content in a cool online TV network format that's compatible with Chromecast and other devices. Sidereel.com: I'm new to this one, but it looks to have lots of good free TV options. There are a ton of other free video sites out there, this list only lists some of the ones I found to be the best. Have some free online video options that you use? Let us know about them in the comments and maybe I'll add them to the list. Redbox: Redbox allows you to rent a new release movie for $1 a night, which is an extremely low cost movie rental option. Search for coupon codes online for free redbox rentals, and it can be even cheaper! Amazon Instant Video: Amazon Prime members can stream hundreds of movies and TV shows included in their $79 yearly Amazon Prime membership. Other premium or recent movies and TV shows may have a purchase or rental cost. Amazon Instant streaming is now integrated with Xbox 360 and a variety of other media players. Vudu.com: Watch hundreds of TV shows and movies for a low cost. Sling TV: Online streaming cable replacement service. Starting at $19.99. Ready my full Sling TV Review here. Fubo TV: Fubo TV is a relatively new streaming service that has a ton of live TV stations, and specializes in sports content – for $34.99/month. Read a full FuboTV review here. PlayStation Vue – $39.99/month: This service has quickly become my favorite cable TV replacement streaming service, if you need to watch sports. It offers a ton of channels and an unlimited cloud DVR, ability to get local and national sports channels and more. Read my full PlayStation Vue review here. Philo TV– $16-20/month: Philo TV is our current favorite streaming service. We pay only $20/month and we get 50+ channels. The only catch is there is no sports or news channels included since those are some of the most expensive. Read my full Philo review here. Your Local Library: Your local library will most likely have a decent selection of DVD movies that you can check out for a week or more. My local library tends to be a bit picked over, but if you get on a waiting list you can usually find movies or TV shows you'd enjoy watching. Borrow From Friends: Borrow movies and TV shows from friends and family. They already own a ton of DVDs, they may as well get some use out of them! My suggestion? Read this article, do some research, and find your own low cost option for watching the TV shows that you love. If you put a few of these tips above into practice, you can save thousands of dollars, just like we have. Do you have other suggestions for low cost or free options for watching TV? What setup do you have at your house, or do you still pay for cable or satellite TV? Are there shows that you think you can't get by using these free video options? Tell us your thoughts in the comments! We had a sweet setup for awhile with Boxee and Apple TV, but then Hulu took the content away. :( We returned the Apple TV and then learned about this workaround. Seems slightly unethical and complicated to me. We actually enjoy snuggling in to bed once our children are in their beds. It’ss nice to sit in bed and watch TV together instead of being in separate chairs or on the couch all smooshed. I’ve heard of Boxee, although I think you’re right, they blocked that one for Hulu. Thanks for the link. I think going without cable is a lot easier now than it was even 5 years ago. Thanks for the link to my post! Within that post I have 2 more posts linked that show how I got rid of cable. For me, cable is a pretty unnecessary expense at this time. Good post and hopefully the word spreads! That’s the only reason I’m still really tempted to get cable TV – so I can watch my Minnesota Twins, Wild, and other sports teams. That and the History Channel.. :) For now I’m having willpower. History channel now has an app! What advantage does Playon have over an S-video or DVI cable going from the computer tower to the TV? Playon may not be for everyone, and if you have a computer right there next to the TV, that might be a viable option as well – especially if you can hook up the audio from the computer to your stereo. This is a great overview. We’ve been using the Roku box for Netflix for a few months and I definitely think we can do without cable. This article gives me plenty of options to think about. Another one to add is boxee.com basically the central place where you can stream from multiple sources. I think if this continues and it becomes easier for users to watch TV from computers on TV this will increase. Great explaination of things you can do. You can use the PS3, Xbox 360, or even XBMC on the Original Xbox to connect to PlayOn. Also check out Tversity. It offers a lot of the same functions as PlayOn and some more. Handles local file better too. Both products are great and I run both. Each one has advantages. I agree, Tversity is another good one. They each do things well, and others not as much. Does Playon take the place of Xbox Live? I was about to pull the trigger on getting my 360 set up with Xbox Live, not so much for the online gaming, but for the streaming video through Netflix. Playon sounds like it is cheaper, but I’m not sure if it is the same vehicle as Xbox Live to get to streaming video for TV & movies. Xbox Live and Playon would be separate. Xbox live allows you to stream netflix movies/tv shows without playon (obviously you still have to pay for netflix). You can also rent tv shows and movies through xbox live marketplace and download them to your hard drive. That isn’t cheap though. Playon works separately from this stuff. It also streams netflix (although native xbox netflix streaming works much better in my opinion) and also streams a ton of other video services like hulu from your computer – to the xbox. Again, to get netflix you still have to pay for the $8.99 streaming package. Also, in saying the Xbox Live streams better, what do you mean by this? Does it down load faster? Less interruptions during viewing? As far as the xbox streaming netflix better – i think it is better because the shows stream with fewer/no interruptions through the xbox netflix interface – although it seems to work fine through playon too – it just has a few more interruptions and the interface isn’t as slick. On Xbox live to download TV shows (unless they are netflix and you’re already paying) it would cost for each show you download – kinda like renting a movie. A’ight, so bottom line is I would not be able to watch CBS.com (current episodes) without playon? The TV content is free supported by ads, and streamed from sites that have paid for the content. Granted some of the movies might be torrents. Sorry, not to many free movies sites out there. Great article by the way. Well written and great research. If you don’t mind old movies, you can legally download public domain films. Google public domain movies to get a list of sites. Thanks Peter, I’ll keep struggling till we get more services or something is invented to conquer their strangle-hold on the country folks! Thinking about moving to Columbia Mo. though, and they are much more advanced there! As much as I’ve tried to use this same plan to justify an Xbox 360 the wife just isn’t buying into that one. She does love Hulu though and we’ve resorted to that for plenty of SNL goodness. Great analysis Pete – it is pretty cool how technology is offering us so many options! Great Post, I agree too, Tversity is another good one. One way or another, you are going to have to pay either the local monopoly cable company, or the local monopoly telephone company, for broadband Internet access. And they tend to often charge *more* for Internet only, or refuse to sell it, mandating you pay for a bundle that includes either TV or phone service. I do pay for internet service, you are correct -but I have extremely fast broadband for $36.99/month – which isn’t too bad. I would be paying for that Internet access either way -with our without all the TV services – so i didn’t count that. Who is your broadband provider for $36.99/ month? I just changed my home phone line setup and discovered my 36.99/mo Internet plan is now 19.99/mo for 12 months, then up 1o bucks after that….still cheaper than what I was paying. Call Qwest and find out if they have same deal for you! PS – I had called to cancel. So, perhaps that was their incentive to offer it cheaper, plus I kept one phone line bundled with Internet to get that price. THe phone went to 35 per month with all free national and Canada calls from US. Plus other features….not a bad deal. Prob. offering because everyone is cancelling to cut back on expenses. Great information, I just passed this article onto my husband. Thanks for the post! Great post! There have been some rumors that Hulu is going to start charging for the content in 2010…so it’s always nice that the shows are also on the network pages! I’m a huge fan on Netflix. I have the basic package (~$9/month) and watch a ton of TV shows and movies through the streaming online option. I’ve heard that rumor about Hulu starting to charge for content. If they do start charging i certainly hope they keep it cheap – or have a two tiered system – one with ads for free, one without. Thank you so much! This was very useful. hey all a great site i found for watching free tv online is TopFreeTv.info. good selection and constantly updated. Great article Peter, thanks. I’m going to try doing this with the WII I bought my kiddos last year. Hope it works. WIll this work for mac? Hey, great article. I really want to try this, but I have an imac. Any suggestions? we watch shows online using the laptop connected to tv thru hdmi, we have dsl connection. i was thinking about getting another laptop, keep it just for that purpose, is that a good idea. what is the min. speed for the laptop in your opinion? also with that i was thinking to get a presentation wireless mouse, to navigate thru the different websites. we don’t have xbox or wii or ps3, not interested in games, so is having a dedicated laptop better solution for me or getting a gaming system? It really depends on your personal preference I think. I can’t tell you how powerful of a laptop you’ll need, but it should probably be powerful enough that it can allow you to watch streaming video/etc. Because of that many netbooks probably won’t fit the bill. Most other entry level laptops probably would work fine. I also have an old computer hooked up to our tv, which we can use in a pinch for this type of thing. We use a wireless mouse and keyboard to control it. It works just fine. Personally I prefer having a game system as it just works well for watching TV/movies/etc with the remote. I’m sure, however you could probably find a similar option for a remote to use with the laptop – it would just probably cost a bit more than an xbox. I have 2 PS3, can I use one playon in one PC to control 2 different TV? Can I use one Playon license for more than one PC? Can I have 2 PCs with playon seperatly control two TV2 at the same time? To be honest, I’m not sure? I think the license only allows you to use it on one computer at a time? How can you integrate the signal between online and antenna into the TV? If I buy a TV with a RJ45 port, can I connect to the internet cable and start to pull free on-line contents to watch ? The TV will have a tuner built in, and you can use your antenna to pull in over the air content. The online things will be streaming from your connected computer to your Xbox or other network media player. Or you can just hook the computer up directly to the TV. Can I utilize the Playon software to stream MLB tv.com games over my wireless network to a tv using a Wii? Netflix just added the Wii as a viewing device; it requires a CD from Netlix but it now appears a choice on the Wii Menu and works just fine. Would it be possible to stream games from MLB,com in the same manner? My understanding is that you can stream MLB.tv, but I don’t have a Wii or a subscription to MLB.tv, so I can’t tell you for sure. A good samaritan gave me “Toshiba” satellite receiver box and the dish. He told me that I need to subscribe with either Dish Network or DirectTV to watch any TV program. However, I think that he is wrong after reading your advises. Could you help me to tell me what I need to do further, please? I just want to let you know the model of Satellite Receiver ==> Toshiba TSR-101. Can I set up this system and the satellite disc to receive Free-To-Air TV program? Please advise. What if I have multiple T.V sets. Can I use them all with your system? as long as you have multiple media players as well (xbox/playstation/etc) you can have only one computer setup and running the playon server. Hey, i’m trying this Playon thing out but im from canada and most of the decent things are blocked to me. do you have any idea if there is an equivalent to these stations that i can access? Thanks. I read your post and I am ready to save 900 a year I do not want to keep spending that kind of money. I was thinking about buying a used wii on ebay and doing the set up do i still need the Playon software? or can I just use the wii to connect ? It depends on what you want to do exactly.. If you only want to to watch netflix movies/etc and have a couple of other free streaming options, you don’t need playon. 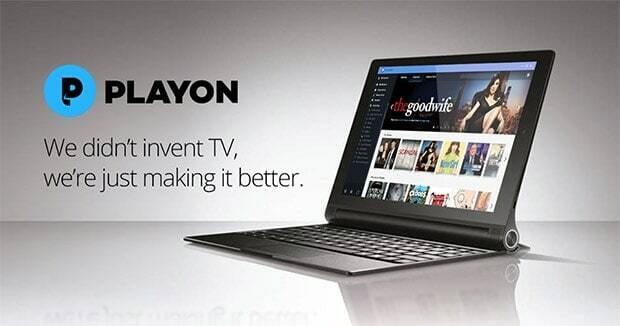 But if you want to get hulu and a ton of other things – you’ll need playon. by watching tv this way, do you not get a big charge on your internet bill. does it not fall under the downloading category? i am looking to get it but i am afraid that my internet bill will be high. i am not certain of how the concept really works. can you please assist with this? Is there any advantage to using the Playon software if you already have a computer with 2 or more video cards that can support more than one display at once? Does the Playon software respond to the remote from the “player” device? My wife and I made the decision recently to drop our premium cable service keeping basic cable and internet service. We are saving $100 a month and kick ourselves for not doing it earlier. Our kids watch their favorite shows on Netflix and PBS and I get ESPN on my Xbox 360. Why don’t more people do this? Great article! Thanks! Question for you…I read threw most of the posts and maybe I missed this but what about other tvs in the home? My kids have tv’s in their rooms. Would we need separate “everything” for each tv? unfortunately, yes, you’d need a separate box on each tv in order to do this..
BTW, I am posting this on 12/19/10. Didn’t see dates on any posts. If there is no cable is there a way to record programs when you are away (like TIVO)? No, not really, but most shows you might want to watch will show up on Hulu or one of the other video sources a day or so later usually. So you may not get that immediate satisfaction in some cases. Yup, that’s all there is to it. Get a digital to analog converter box/tuner and an antenna, and hook it up to your old tv. You should then be able to tune in your local over the air stations. Thank you so much, that sounds great! But you said its not free so do I have to register it? I mean I just need the local stations no movies required really. When talking about registering, are you talking about Playon? If so, yes, you would need to register it after you trial period is up. If you’re talking about the converter box, all that would cost you is the price for the box itself, no registering for anything. No I think Playon would be too difficult for me to master just yet lol. I start with the converter box and then I see. I am working quite a lot so I don’t have much time for TV just a little. Thank you so much for your help, much appreciated. Cross your fingers pls that it will work, I keep you updated. Peter! It worked…the box searched for the channels itself and it worked just like that :)…well I got like 14 I think. Don’t really get the torrent part that you were talking about but maybe I won’t need that?? THANK YOU SO VERY MUCH because that made my room mate very happy today. I am spending $190 per month, for High speed Internet service on 5 TV in 5 different rooms. I must bring this cost down. I barely watch TV and when I do watch 90% of it is either Trinity Broadcasting Network (TBN) or DVDs. I have 2 HD TVs with Digital DVR boxes, 2 wieless blu ray dvd players, and 3 older model TVs connected to digital cable boxes. I am taking Dave Ramsey’s Financial Peace University course – an can no-longer be such a poor steward over the finances God has entrusted to me. I need help,,, making sure that I’m understanding in the SIMPLEST terms possible, what my best options are, to watch TV and not pay out the nose to do it. For the older TV’s I think just getting the digital to analog converter box with an antenna is the answer for getting whatever local stations broadcast free over the air – This should be sufficient, as these rooms are empty 80% of the time. Karen, in a lot of local areas there are companies that will help you to setup a cord cutting package with over-the-air TV, DVRs, etc if you want to get rid of your cable TV. I’d recommend doing a search and paying someone to help you to set it up. How would I do this with wii station? And I want to have TV in the living room and 3 maybe 4 bedrooms can I do this from one computer? Please explain to me how to hook this free TV system up to all my TVs. I have 2 HD TV’s and I can’t find the owner manuels, for either TV. Can you tell me if there is a quick and easy way for me to tell if these TVs have a built in HD Tuner, by looking at the panel in the back of the TVs? Another thing to do would be to check your TV’s model number and then do a search for the brand and model on google. You can usually find a manual that way. You forgot to mention winamp’s “shoutcast TV” it has varios tv channels including music channels and movies…. Yes, this should work, I don’t know why not! :) You just have to have Playon running on the laptop, and have it connected to that same network as the Xbox, and it should work just fine! Steph, your xbox would need to be hooked up to your home network via an ethernet cable or wireless adapter, and the laptop should be connected to the home network via an ethernet cable or a wireless card. As long as they’re both connected to the internet and your home network, you should be fine. Great article, very helpful. Too many comments for me to read them all, but we’ve looked at SkyAngel for TV as well, which used to be satellite but is now streamed over the internet. It’s still $25 a month, which I’m still too cheap to pay, but it would be a different option for those that want more specific channels. Also, our computer has an HDMI out port, so we just hook it up to our HDTV and get full screen for any website that streams videos. Cuts out the middle man. Something to think about next time you buy a laptop. Thanks so much for the tip. God Bless you for your kindness. Someone let me know when you have a setup to watch HBO or SHOWTIME FREE! Especially the Boxing part! Thanks. I agree… If you just be smart and find other ways to get the entertainment without going to cable TV, you would be saving a lot of money. I also agree that you shouldn’t be paying for TV if you are in debt. Use youtube to learn ways to get free tv. I just canceled cable and now I will find out what’s available to me through hulu or similar sites and also with just an antenna Are you in Minneapolis? I’ll play CLUE with you! Why not just use your computer and plug the video card output into your TV? Most people already have at least one computer – if not a laptop at least some kind of desktop system. Many vid cards have HDMI outputs that will plug straight into a TV. Too easy. I have a perfectly nice computer sitting downstairs that I bought and paid for quite a long time ago. That’s a “networked media device” that requires no special wi-fi adapter – just a regular ol’ wireless adapter that you can buy for less than $10. Yup, that is definitely an option. I think its just a good option to use a gaming console or other network device if you already have one. A connected laptop will work as well, but can be a pain if you have to hook it up every time you want to use it. I love the comment about telling someone they should not be paying for cable if they are in debt. How stereotypical, judgemental chrisitan of you. We’ll try anything Dan, but we have to learn as we go since we never had internet by phone til last year, we have a lot more to learn. We are also not young any more so learnin’ comes a bit slower! HaHa. also, how would it work with netflix? You would be limited as to what you could do if you didn’t have wi-fi or internet. You’d probably be limited to over the air TV stations. I don’t know how it would work for running on phone wi-fi, but my guess is your data bill would run up quickly.. Probably cheaper to pay for the internet. Is there a way to watch cable channels free on my TV, like oxygen, bravo, and E!? I know you covered watching them online thru you computer, but will those channels stream to my TV? So pretty much if the channel let’s you watch their shows online it should be available thru playon? Not necessarily, it either has to be built in automatically to PlayOn, or it has to have a plugin available. You can find what plugins are available here. New plugins are always being written, so if you don’t see one now it may show up in the future – especially if that channel has an online stream already. I think you are right that nothing beats cable or dish when it comes to to the large amount of content that’s available from a single souces, so I guess it just boils down to how much you’re willing to pay for that convenience. OK, what about internet to stream all of this content? All of the internet in my area that’s not dialup is only to be had from the cable providors. kimd of defeats the purpose of going the other way when the internet access is $50.00+/ month anyway. I pay $35/month for my DSL high speed internet, and I would need that regardless of whether I had cable or satellite. I guess the post kind of assumes that others need or will have internet as well. I pay for cable just to watch Christian and inspirational channels. I get Daystar, Impact, Word Network, Inspirational Channel, GMC, etc. If I could get them another way I would cancel my cable. Most of what I have read in the past were complicated or too teck for me to do. 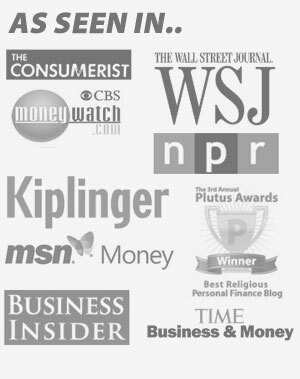 Does your plan work for these channels too? Please be specific. God Bless. We have been teetering but it runs the phones down very fast. Currently we have unlimited data plans but they are becoming obsolete. I am in an area that supports all options. but NOT satellite, dish etc.. because I live in a apartment complex that does not allow me to hace it. what is the very cheapest way to use tv? We haven’t paid for Cable TV since 2005…and we’ve never missed it! those of you who are using your wireless phones for a lot of streaming video……thank you. you are the reason why grandfathered unlimited plans, etc are being stopped. we’ll all be on tiered plans. I haven’t found any good legal ways to do it. If you find one, let us know! Does your internet cost go up if you use internet to tv often. We don’t use the streaming video options very often, but even in the months that we do, I’ve never had any issues with our rates going up. I’m sure that’s not the case for everyone, however. My husband likes to watch politics. Can he watch msnbc this way, as well? I think the live sporting events is what keeps a lot of people from canceling altogether, I know it’s still one of the choke points for us. what am i missing ? dont i need high speed internet First ? Yes, you need high speed internet. In this day and age most people have that already. If not, this probably won’t work. IS THE SONY BOX ANY GOOD. Thank you for a well written article. I finally canceled the cable one night after scrolling through countless channels of infomercials and shopping garbage on TV. I realized that out of the hundreds of channels that were supposedly available, I only watched a handful, and I was paying a bunch of money for a bunch of empty “stuff”. I supplement by watching Hulu, Netflix, and I also got a Chromecast so I can view other content from my computer on the main TV without having to hook it straight up to the TV. As long as the cable is a decent speed, watching content that I actually want to for FREE or paying very little to see it is awesome. I grew up in the time when cable TV was a luxury, a creative technology that consisted mostly of MTV, not something that folks saw as a necessity. Not having to fork over almost $100 a month to the cable TV company is a liberating feeling. I plan to buy a new projector and want to run my apple computer through it to work and stream online movies and shows. In reading all of the advice about playon, I would probably resort to the open air/antenna option mentioned above because I know I wouldn’t watch enough of what playon offers to make it worth the subscription. What should I use to connect the projector to the computer and the open air channels? I have coaxial cable coming into the apartment. Could I potentially use that to connect to the open air channel? Also, would I need to get a digital/analog converter for the projector, if so what kind should I buy? I’m pretty sure there are wireless speakers that you could use to stream audio. I know i was looking at some a couple of years ago that were pretty decent and didn’t have a delay. I haven’t looked recently, however, so I’m not sure what’s available or what would be a good option. I don’t do video games, so I don’t have X-box or other. We do have a blue ray player that is wifi capable and can get netflix, hulu and many similar things on it. Is there some advantage to the playon software over the typical blu-ray player access? I’m amazed that folks are willing to spend $100-$150/month on CATV. Cut our CATV cord about 2 yrs ago, but we don’t like the main sports shown here. Broadcast TV is NOT what we all remember. There are lots and lots of channels, stations, oldies, and new shows. In the Atlanta metro area there’s a lot of broadcast stations available. We get almost all of them. Other metro areas should have a similar website – google is your friend. * Hulu Plus – most streaming devices DO NOT WORK with plain, free, Hulu. We’ve had Amazon Prime for 6 months now and are just finishing watching the TV and movies on it that we wanted to see. In a month or so, we’ll add Netflix streaming and use it for 6 months to catch up on the tv and movies on on that service. * higher is better than lower. * attic mounts are better than lower. * outside mounts are better than attic. * any obstuction will reduce signal reception – including leaves, trees, hills, walls, shingles, house-wrap, A/C ducts, joists, clouds, and people standing in the way. * weather matters too, but much less than with analog TV signals. Heavy rains only matter for “fringe station” reception. Strong signals work perfectly regardless. Is there any way to use PlayOn directly from the computer to the TV, instead of using an XBox or other device? I use XBMC as HTPC and use lihattv.com plugin to live tv streaming. it’s absolutely free. 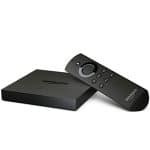 lihattv aslo support for other device such as Boxee, Plex, PlayOn, MAG250. I know that Netflix is like that, (watch last most recent episode etc). That would work for us, except for the NFL/ESPN one. He wont want to watch a football game 1 week after it already aired which I doubt anyone that is a sports fan would. heh. I have never purchased HULU or anything cause I already netflix anyhow I would appreciate anyone that could help me out with this concern. I dont know if I am making any sense or not but I hope you understand what I am saying. also how many tvs can be used with this ? or do you have to buy it for each TV that you have? This is not really going to be live TV when you use playon or another source. It’s typically going to be already aired shows that are now available through streaming sites for viewing. Hulu will give you access to quite a few shows the day after they air I believe if you pay for the service. If you don’t I think it takes a few days for the latest episodes to be available. Hulu is probably the go-to source for broadcast tv type shows. For football -at our house we just use the antenna and most of the time my sports teams are available on local TV – although some sports may be tougher to get this way – like baseball or hockey games. Otherwise you’re able to get the shows you want by paying for them in some cases – like buying via Amazon, Google or iTunes. We live on fixed income and currently Directv and we are paying out over $100.00 a month and it is killing our budget! Are there providers over the internet, wifi to the playstation, or wii for free or for a very small yearly amount. I have a seasonal show/program on starz and want to watch it when it is actually being shown. Interesting article given my hate for comcast so I have a question. Are you a football fan? Are you able to watch colIege football? I don’t care about many shows but the only thing holding back from firing comcast is not being able to watch college football. I am a football fan but mainly NFL. Sports are definitely one of the holes if you plan to cut the cord. I can get my NFL games just fine but if I want to watch my college team it can be tough. I checked out play on. I found its list of channels. What I am bummed about is the three main channels we watch: FX, Hallmark, & ABCFamily- are not included on that list. How do I get those stations? From PlayOn: Networks like AMC and FX tend to split their content between their own websites and video services like Amazon Video on Demand and Netflix. So essentially you’re stuck watching through those sources older seasons through netflix, or current season via Amazon for an extra fee – especially for some shows which they don’t offer online unless you have a cable tv provider login. I am so sick of people and others saying “watch tv for free”!!! No matter what system you use, IT IS NOT FREE, YOU STILL HAVE TO PAY FOR INTERNET! In some cases that is more expensive than cable etc. I’ll stick with the good ol’ local channels and be happy with the cost of my tv watching being limited to the cost of the tv and a cheap antennea. Thanks anyway! Can I download play on from my laptop or notebook?! My laptop is a 2006 or 2007. Can I use my 2006 laptop or newer notebook to download play on?! One time fee of $60 for software. $200 for an xbox which must be used because they are more expensive than that. Freedompop one time fee for $99 and then $20 a month because nobody will be happy with the 1gb. $9 a month for netflix. So cable and internet package is about $700 a year and this is all about $400 for the first year and then after a year when you realize there is a lot you cant get like live sporting events you end up going back to regular cable. Doesnt sem like a big savings. Entertainment costs money. Turn it all off and go for a hike or a bike ride. These days you’re likely fine spending $35 for a Chromecast or $50 for a Fire TV Stick, and then paying $9/month for Netflix and a similar amount for Amazon Prime. Still leaves a hole for live sports, but if that is important, there may be alternatives. Much cheaper than it used to be when this post as first written. What you’re suggesting is not cheap at all. Playstation: $200! TV– we don’t own one. We have laptop and desktops and books in our home. Buying a $35 Chrome stick takes care of most aspects. We can reward kids with Summer movies for only $8/month on Netflix Or paying $8 a month for Hulu…that’s cheap. We can block shows from the kids. Change passwords so that we can control what and when they watch. Agreed. If you don’t already have a game console your best bet is probably going to be a Chromecast, Fire TV Stick or other affordable option ($50 or less). Depending on your exact setup a computer may or may not be needed. If you want to use PlayOn for example, a computer is needed to run the PlayOn software. Full PlayOn review here. If you only wanted to watch Hulu or Netflix, I believe the game consoles have apps you can download for those services. If you want to mainly watch shows via over-the-air broadcast, you don’t necessarily need a computer. Again, it depends on what cord cutting package you end up with. The thing to do is figure out what shows you absolutely want, and craft your cord cutting package around those shows. What I can’t find and don’t want to do without is Music Choice, HBO, Showtime, and sometimes Starz! Anything available with these???!!!! If you find anything out please let me know. I’m trying to get rid of cables premium channels if I can watch them with Roku. With no Internet or TV service, your options may be limited to over-the-air broadcast TV. IF you have a more recent TV you should be able to hook up an antenna to your TV and get all the over-the-air broadcast channels. Without internet there aren’t many options for getting TV programming on the Xbox. Over the airwaves is not an option for me.My only option is to connect to the cable/internet provider and pay for either the cable signal or the internet signal.If I cut out cable and watch tv via internet I’m faced with increased internet costs up to an unlimited connection and fewer viewing options. Enjoyed your article very much thank you too by the way for all the wonderful information and pricing it greatly helps me in my decision-making to get rid of satellite forever and figure out my smart TV once and for all connecting with my Xbox one! If you have any other ideas or suggestions I’d appreciate hearing them. I’ve spent too much time trying to make sense of what’s available and upset being a hostage to TV money mongers and their outrageous charges. Your insight is very well appreciated. please us updated. thanks for being there. I love PlayOn, but I wish there were scripts written for Daystar and TBN. I tried to write one for Daystar but I wasn’t successful. Are you aware of any scripts for these networks? Sorry, i’m not currently aware of any scripts for those networks. Good info I intend to watch the how to videos. It would be helpful if you would tell the date you are doing these different things because technology is rapidly changing. I have tv with converter box, which worked fine for about 2 years. Now they both loose signal after about 10 minutes of use. Trouble getting it to come back on. will this antena work in malawi? Searched Google for “watching free TV”, your title “How To Watch Television For Free Without Paying For Cable Or …” came up. Your article has NOTHING to do with anything resulting in watching “Television For Free”! You basically said that you pay for software DVR and Netflix. $9 a month ($108 a year mind you JUST for Netflix) and $60 DVR. HELLO!!! How is that free?! Some “Christian”! Then again Trump is a “Christian” and the one who brought back “Merry Christmas”. Next Post: Cash For Clunkers Rebate Program Might Save You Money On Your Next New Car Purchase. But Is It A Good Idea?